Leading manufacturer of high-performance test & measurement solutions including dynamic signal analyzers, vibration controllers, shakers, and accessories. Established in 1984, Data Physics designs high performance test and measurement solutions for noise and vibration applications. Data Physics is a leading manufacturer of sound and vibration test equipment. 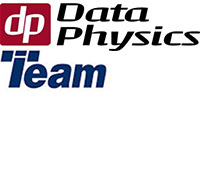 Data Physics, owned by Battery Ventures, was founded by two Alumni of Hewlett Packard in 1984. Dave Snyder had designed hardware and software for the Fourier Analyzers developed at the Santa Clara Division of HP. Sri Welaratna had worked for HP in England, Europe and then in Santa Clara developing applications of Fourier Analyzers. The first project Dave and Sri did together was the design of the UD 400AT vibration controller, the first to use a PC as the host computer and a DSP based signal processing peripheral. This project began in 1983 and used the Texas Instruments TMS32010, the very first Digital Signal Processor. Starting with the SignalCalc software library for HP Basic computers Data Physics evolved to signal processing solutions on PCs using add on DSP hardware to provide the computational power required for realtime measurements and analysis. In 2014, Battery Ventures bought a controlling stake in Data Physics. DP is the fifth active industrial-technology platform in the Battery portfolio. In 2015, Battery Ventures acquired a controlling stake in both Lansmont and Team Corporations, establishing the foundation of the Noise & Vibration Technologies (NVT) Group. 2005: Acquisition of Gearing & Watson Electronics, Ltd.
2009: Acquisition of Ling Electronics, Ltd.
2014: Battery Ventures purchased a controlling stake in Data Physics Corporation. 2015: Lansmont and Team Corporations join Data Physics to form the Noise and Vibration Technologies Group. Data Physics has been supplying high performance solutions in signal processing to the noise and vibration community since 1984. With a full line of electrodynamic shakers to complement its vibration controllers and dynamic signal analyzers, Data Physics is a total solution supplier for vibration applications. Data Physics products are “Made in the USA” and “Made in the UK”. Data Physics manufactures products that are “Made in the USA” and “Made in the UK”. © 2019 Southern Marketing Associates, Inc.